Eight European religious leaders met with Frans Timmermans, vice-president of the European Commission. 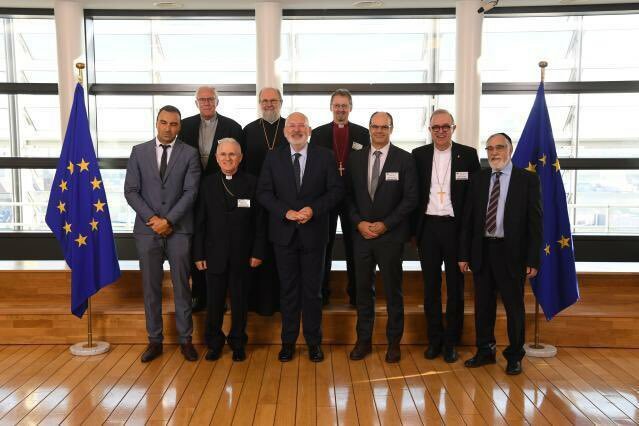 Timmermans hosted a meeting on Monday with eight spokespeople for religious organizations from across the EU, ranging from the Church of Greece to the Conference of European Rabbis. The imam of ‘El Fath’ mosque in Gent (Belgium), Khalid Benhaddou, who has been awarded with a Human Rights prize in his country, attended the meeting as representative of the European Muslims. “Europe is home to people of many faiths, and every European has the right to practice his or her faith in peace and security. The European Commission will continue to stand up and speak up against any discrimination or attacks that their communities might face,” Timmermans said. Participants at the meeting discussed how the EU is addressing “migration, social integration and the sustainability of our way of life”. These are the “main policy challenges Europe faces” ahead the European Parliament elections next May, according to the European Commission. This was the 14th annual high-level meeting with religious leaders organised by the Commission. Since 2009, the dialogue with churches, religions, philosophical and non-confessional organisations is enshrined in the Lisbon Treaty (Article 17 of the Treaty on the Functioning of the European Union).